If your business has valuable assets or loaned equipment, identifying and tracking them is essential for security and productivity. With over 40 years’ experience, GSM Barcoding can design and supply asset labels and fixed asset tags to help you keep track of assets inside and outside of your organisation. From simple vinyl asset labels to customised tamper-proof security tags, we supply full colour digitally printed labels using the material and adhesives specific to your particular application. With so many factors to consider, our team of label experts will help you to make sure your label design is right first-time and ready when you need them. For more information contact one of our label experts today. 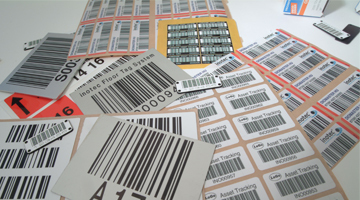 GSM Barcoding offers an excellent range of asset labels including white and silver polyester labels, custom labels and a range of security and tamper evident asset labels. Our range of asset labels can be used with G-SMart Assets, our web-based asset management system, or as part of your current asset management process. Asset labels are designed to be either non-removable or non-transferable to ensure accuracy in your asset tracking. This is achieved either by using special adhesives or tamper evident labels, which can be destructible or void depending on the application requirements. Asset labelling is the key to fast and accurate data collection and the correct solution is important to the success of the application. With GSM barcoding’s experience in providing end to end barcode driven solutions, we will recommend the best labelling, hardware and software application to ensure your requirements are fully met. If you don’t currently use an asset tracking system then you may wish to consider the G-Smart assets management software for creating an asset register and provide visibility over your assets. The software is web based for flexibility and can generate asset numbers and print labels using thermal transfer printers both in fixed location or via mobile printers, allowing point of application labelling. Low cost asset labels and tags designed to your exact specification. Our asset tags and labels come in a range of colours, sizes and materials from low-cost vinyl labels to more durable polyester asset tags. If you would like some advice or a quote for your labels please contact one of our team and we will be happy to help you. Track assets in tough environments with durable asset tags and labels. If your assets operate in a tough environment such as manufacturing plant or in the field then a durable asset tag or label will be essential. We can manufacture labels and tags using materials that can survive high temperatures, sunlight, abrasion, solvents and more. For the ultimate resistance from abrasion and chemical exposure the polycarbonate labels work in tough environments and are laminated for heavy duty protection. Aluminium tags have your information etched onto them and can work both indoors and outdoors. The labels are durable and can survive high temperatures, sunlight, abrasion, solvents and more. If you would like to speak to an advisor or would like a quote for your labels please contact one of our team and we will be happy to help you. Security labels enable you to prevent theft of high valuable assets such as IT equipment using non-removable labels. If your organisation has assets that are high value and elevated risk of theft then utilising security labels may discourage losses and prevent asset relocation. Perfect for schools and colleges security tags show clearly when an asset label has been interfered with or there is an attempt to remove the label. Destructible vinyl asset labels perish on any attempt to remove them, making it very difficult to remove. The tamper evident label leaves behind a void mark which deters theft but also can deter anybody wishing to transfer the label to a different asset. If you would like to receive a sample or would like a quote for your labels, please contact one of our team and we will be happy to help you.